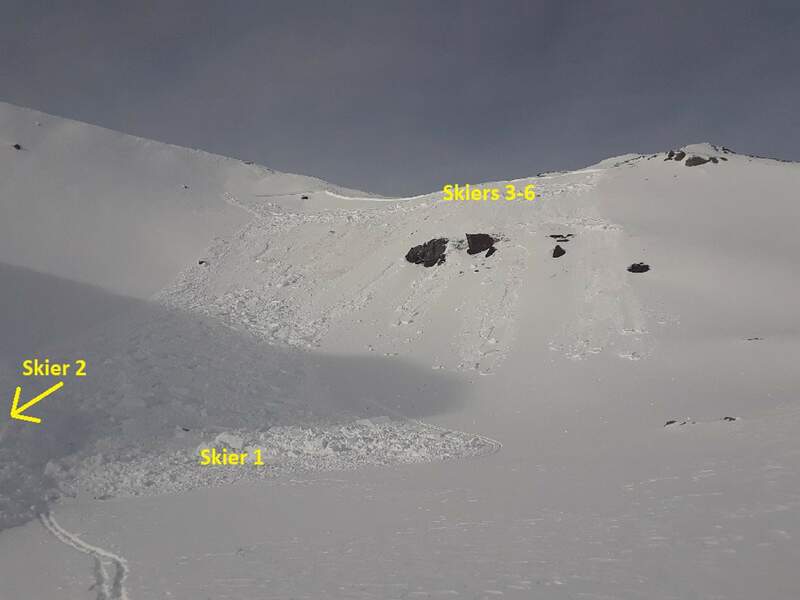 The avalanche slide paths where a backcountry skier was killed Jan. 5 while taking part in a Silverton Avalanche School course on Red Mountain Pass. The two avalanches triggered by the group are outlined in red. The red arrow is pointing to the estimated area where the group entered the slope. 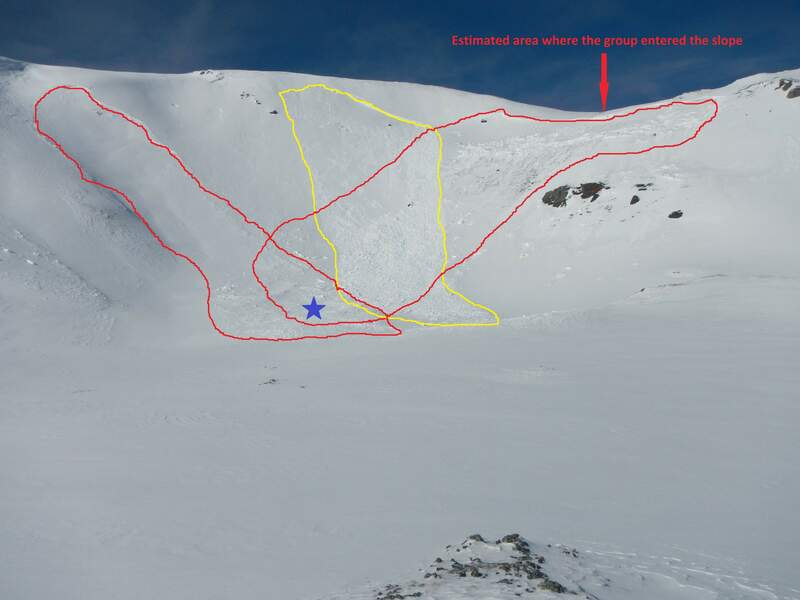 The avalanche outlined in yellow was triggered with an explosive on Jan. 8 during search and rescue operations. The blue star is the approximate location of the burial site. Several misjudgments led to an avalanche that killed a backcountry skier participating in a Silverton Avalanche School course earlier this month, according to a report. The Colorado Avalanche Information Center released its final report Wednesday about the avalanche that occurred Jan. 5 near Red Mountain Pass, in an area known as Upper Senator Beck Basin at about 13,000 feet in elevation. The group was traveling together down the mountain, which resulted in all six people being caught in the avalanche.The group misjudged the avalanche danger for the terrain they were traversing.The group failed to take into account the risk of triggering avalanches on adjacent slopes.“It took all those events together to produce a death,” said Ethan Greene, director of the CAIC. The group of skiers were taking part in a Level 2 course, a three-day program for advanced backcountry skiers, with the Silverton Avalanche School based at the St. Paul Lodge outside Silverton. The Silverton Avalanche School declined to comment Wednesday but said the school would issue a news release later today. According to CAIC’s report, the six-person group had meticulously planned a route to minimize risk and avoid areas with high avalanche danger. For most of the day, the skiers were able to avoid avalanche areas and reach the top of South Telluride Peak, the CAIC report said. On the way down, however, things took a turn for the worse. 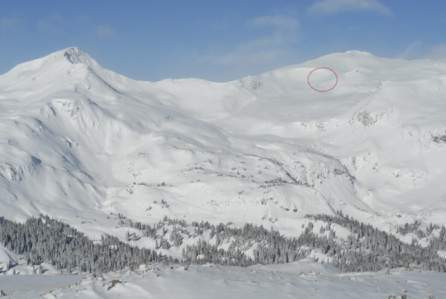 The area where two avalanches killed a backcountry skier who was taking part in a Silverton Avalanche School course earlier this month on Red Mountain Pass. The group had two options for its descent: go back the way it came, which Greene said would have been the safer option, or take a different route that entered more “complicated” terrain to read for avalanche danger. The group chose the more complicated route. The Silverton Avalanche School guide was the first to go down, followed by student Peter Marshall, 40, of Longmont. The rest of the group then followed behind. It’s not clear who triggered the avalanche, but it caught all the skiers, carrying them downhill. Only the guide, who is not identified in the report, and Marshall, however, were buried. The first avalanche then triggered a larger, second avalanche on an adjacent slope, burying Marshall under 8 feet of snow. It’s estimated the crown face of the second avalanche was 36 inches. The second avalanche did not reach the guide, who was able to unbury himself. The guide and the rest of the group, who were not buried, turned on their beacons to try to locate Marshall. It took about 50 minutes to find and dig Marshall out of the snow. The group then tried, unsuccessfully, to revive him. Greene said that rather than assigning blame, it is important to use the fatality as a learning experience. For one, it’s basic backcountry travel protocol to travel one-at-a-time down a slope. That way, if an avalanche is triggered, it is more likely the slide will catch only one person. Greene also said the group, while planning its route at the hut, got only part of the avalanche forecast for that day. Had the group read the entire report, it would have known that even if group members were in terrain with low-avalanche potential, there was still a high potential for triggering avalanches on adjacent slopes, which is exactly what happened. The group had read the full report for the previous day, which contained that information, but that does not excuse not reading the entire avalanche report on the day the class went into the backcountry, Greene said. “They didn’t read the whole report, and they missed that,” he said. Looking up at the first avalanche triggered by a group on Jan. 5. The yellow labels show the approximate locations of the skiers at the end of the first avalanche. Skier 2 was buried outside of the frame of this image. None of the members saw whether the first avalanche buried Marshall, before the wall of the second avalanche came down, the report said. But it is clear the second avalanche dumped more snow on top of him. It was also noted in the report that Marshall was wearing an airbag backpack, but the bag had not been deployed. “He got hit by a big wall of snow, so we don’t know if a bag would have helped, but it’s possible,” Greene said. Marshall’s death marks the first avalanche fatality in Colorado this year, as well as the first death in the Silverton Avalanche School’s nearly six-decade history.